Rice has won three senior caps for Ireland. 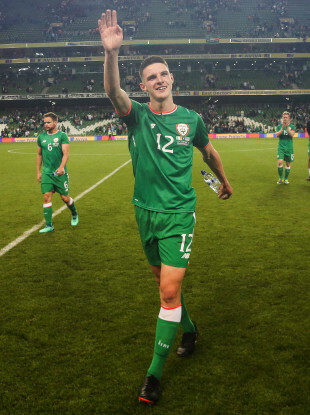 MARTIN O’NEILL REMAINS hopeful that Declan Rice will commit to the Republic of Ireland. The Ireland boss also expressed shock at a fresh report which indicates that Rice has already decided his international future lies with England. Rice wasn’t included when O’Neill revealed a 32-man provisional squad for Ireland’s Uefa Nations League games against Denmark and Wales (13 and 16 October) this morning. According to O’Neill, the 19-year-old West Ham United player is still assessing his options after England, his country of birth, recently declared their interest. “I’ve spoken to the family and I’ve spoken to Declan,” O’Neill said after his squad announcement. “They obviously want a bit more time to make their minds up and I’m comfortable with that. However, moments after the Ireland boss insisted that Rice has asked for more time to make a decision, a report from Sky Sports News claimed that the versatile youngster “has decided he wants to play for England”. Rice, who qualifies to play for Ireland via his grandparents from Cork, impressed while making three appearances for the Boys in Green in friendlies earlier this year. He remains free to switch his allegiance until he plays a competitive international fixture. England manager Gareth Southgate is due to address the media this afternoon, when he’ll name his squad for their games against Croatia and Spain. In order to declare for England, Rice would need to complete an international transfer through Fifa. That would require authorisation from both countries’ associations and the process can often take several months to complete. An FAI spokesperson later dismissed Sky’s claim. After his scheduled media duties concluded, O’Neill was then pressed to comment on the report which initially suggested that Rice rejected a call-up from Ireland for the games against Denmark and Wales. “I’m told that Sky are going to change it [the report],” said O’Neill. “Young Rice couldn’t have rejected our call-up because we never called him up. If you have information that I’m unaware of then I’ll have to go and check it through. Rice is currently at loggerheads with his club as he negotiates a new contract, which O’Neill believes may be having an impact on his thought process. “That is very important, of course,” he said during his press conference. “First of all, I think that he wanted to try and break back into the West Ham team. He’s done that very successfully. Email “O'Neill 'surprised' by report claiming Declan Rice has chosen England”. Feedback on “O'Neill 'surprised' by report claiming Declan Rice has chosen England”.